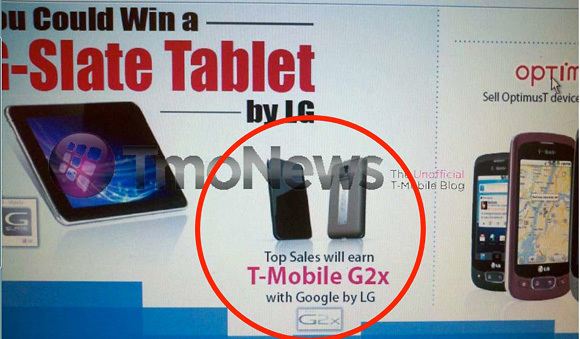 LG Optimus 2X going to T-Mobile USA as the G2x? T-Mobile USA users have limited choice of smartphones as the carrier uses unconventional 3G bands. Well, any T-Mo subscribers with an appetite for the Tegra2 powered LG Optimus 2X should be on the lookout for T-Mobile G2x. Some leaked materials showcase the LG Optimus 2X under the name T-Mobile G2x. The shot is about some promotion (which advertises that you can win a G-Slate, LG's Android tablet) but still, it's a pretty clear indication that T-Mobile will carry the dual-core Optimus 2X droid. Unfortunately, this gives no info on what kind of price to expect or when the T-Mobile G2x will be available (some old, pre-MWC rumors say March). Anyway, we've already reviewed the Optimus 2X and the G2x variant shouldn't be much different that the one we tested. It's possible that T-Mobile will advertise the G2x as a 4G capable smartphone, but on their network that means HSPA+ rather than LTE. And G2x is probably not the cleverest name since there are two more G2's in the operator's lineup, both of which made by HTC. is t-mobile doing it in us?